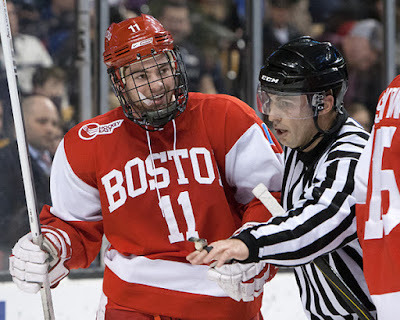 ESPN’s John Buccigross tweeted that BU senior assistant captain Danny O'Regan is expected to sign with San Jose. He was selected by the Sharks in the fifth round of the 2012 draft. 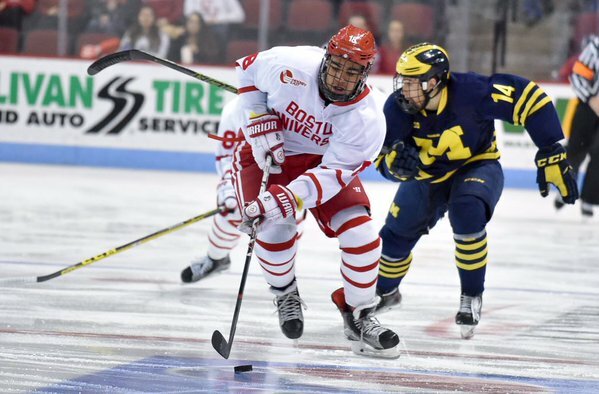 2016 recruit Patrick Harper has been named USHR's Prep Forward of the Year. The left-shot center from New Canaan, Conn., scored 59 points (20G, 39A) to lead Avon Old Farms to a 21-2-4 record and the semifinals of the Elite 8 tournament. BU Today looks at the career of the NHL's youngest head coach: John Hynes: Taking the Devils to the Next Level . Nick Bonino recorded a career-best five points (1G, 4A) in the Penguins 7-2 win against Detroit on Saturday. Jack Eichel’s 23rd goal of the season early in the third period was the game-winner in the Sabres’ 3-2 win over Winnipeg. The goal also lifted Eichel to 50 points. He’s second in scoring for Buffalo. 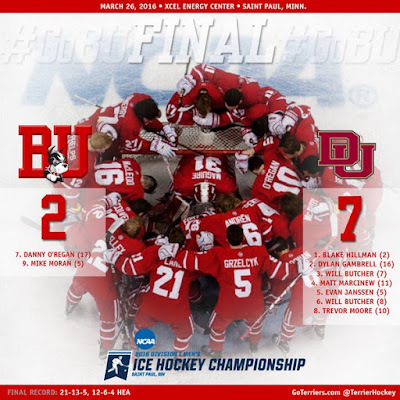 BU's season came to a disappointing end in the first round of the Western Regional as Denver dominated the Terriers, 7-2. The Pioneers scored four times over a nine-minute span late in the first period and early in the second to take take a commanding lead and never let up. 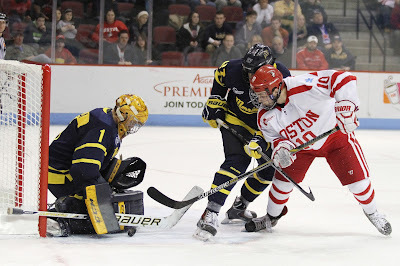 After Denver extended its lead to 6-0 in the third period, BU got on the board with Danny O'Regan's 17th goal, assisted by Jakob Forsbacka Karlsson and Charlie McAvoy. Following another Pioneer score, Mike Moran (photo) closed out the scoring, assisted by captain Matt Grzelcyk and Jordan Greenway. BU finished the season with a 21-13-5 record, dropping four of its final six games. 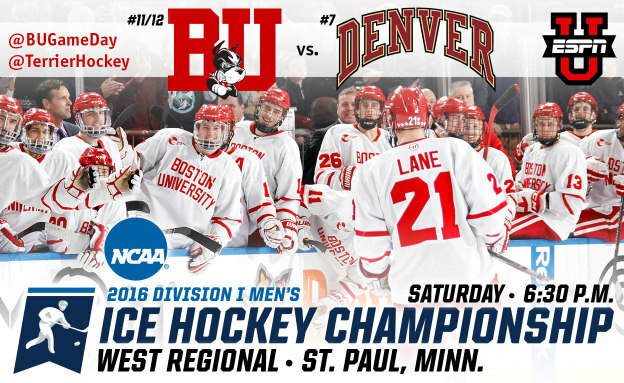 #12 Terriers are back in action today in the NCAA West Regional, taking on #7 Denver at the Xcel Energy Center in St. Paul. ESPNU will air the game live at 6:30 p.m. ET. Making its 34th NCAA appearance, BU has 41 tournament wins, fifth most, trailing only Minnesota, Michigan, and BC. ►Former Terrier Coach Jack Parker is joining Bernie Corbett on the Terrier Sports Radio Network broadcast of today’s game, filling in for Tom Ryan to do analysis. 2016 recruit Patrick Harper scored his first USHL goal and added an assist in Omaha’s 4-2 win against Fargo. Harper had scored 59 points in 27 games as a senior at Avon Old Farms.